Pour the olive oil into a large saucepan and add the chilli, spring onions and fennel. Gently fry until they begin to soften (approximately 10 minutes) stirring occasionally. Once softened, add the spices and garlic and stir for a minute or two to combine all the ingredients. Then add the tinned tomatoes and water. Stir again and simmer for 5-10 minutes. 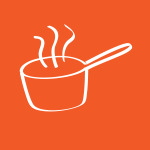 Remove the saucepan from the heat and using a hand blender, give the soup base a light blend. For a smoother soup, blend for a little longer. Return to a low heat and add the diced firm fish of your choice and allow to simmer gently for 4 minutes with the lid on. Remove from heat and when serving, dress with some the fresh basil or coriander and freshly ground black pepper. Stir in some Dairy free basil pesto to add to the flavour. Get adventurous with your greens and feel free to add to this mix. Broccoli, green beans, kale and/or sea vegetables will make this simple recipe all the more delicious and nutritious! Enjoy as an entrée or main course. You can vary this by using salmon, trout, prawns, scallops or tofu in place of fish, or a combination of a few of these things together. This is a great base that can be served on its own without anything else added, a simple tomato and fennel soup. You can also fry the fish in a separate pan with a teaspoon of dried rosemary and then place it on top of the tomato and fennel soup when serving.